Their research shows that it is possible to convert one stem type to another without the need for genetic modification. Researchers, who used rat models, grew stem cells from the thymus - an organ important for our immune systems - in the laboratory using conditions for growing hair follicle skin stem cells. The team was from the Ecole Polytechnique Federale de Lausanne in Switzerland and the University of Edinburgh's Medical Research Council Centre for Regenerative Medicine. When the cells were transplanted into developing skin, they were able to maintain skin and hair for more than a year. The transplanted follicles outperformed naturally-produced hair follicle stem cells, which are only able to heal and repair skin for three weeks. Once they were transplanted, the genetic markers of the cells changed to be more similar to those of hair follicle stem cells. 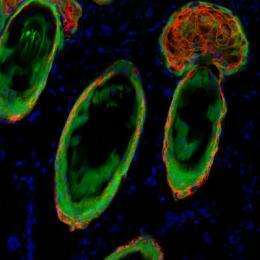 The research, published in the journal Nature, shows that triggers from the surrounding environment - in this case from the skin - can reprogramme stem cells to become tissues they are not normally able to generate. Professor Yann Barrandon, Joint Chair of Stem Cell Dynamics at the Ecole Polytechnique Federale de Lausanne, Universite de Lausanne and Centre Hospitalier Universitaire Vaudois, who led the study, said: "These cells change because of the environment they come into contact with, the skin. In theory this operation could be recreated with other organs as well." When an animal develops, embryos form three cellular or germ layers - ectoderm, endoderm and mesoderm - which then go on to form the body's organs and tissues. Ectoderm becomes skin and nerves, endoderm becomes the gut and organs such as the liver, pancreas and thymus, and mesoderm becomes muscle, bones and blood. Until now it was believed that germ layer boundaries could not be crossed - that cells originating in one germ layer could not develop into cells associated with one of the others. This latest research shows that thymus cells, originating from the endoderm, can turn in to skin stem cells, which originate from the ectoderm origin. This suggests germ layer boundaries are less absolute than previously thought. Dr Clare Blackburn, of the University of Edinburgh's Medical Research Council Centre for Regenerative Medicine, said: "It's not just that a latent capacity is triggered or uncovered when these stem cells come in to contact with skin. They really change track - expressing different genes and becoming more potent. It will be interesting to see whether microenvironments other than skin have a similar effect." More information: 'Microenvironmental Reprogramming of Thymic Epithelial Cells to Skin Multipotent Stem Cells' by Barrandon, Paola Bonfanti, Stéphanie Claudinot, Alessandro W. Amici, Alison Farley, Clare Blackburn will be published in Nature on 19 August 2010.